On March 2nd, the David Asper Centre for Constitutional Rights hosted a conference on Public Interest Litigation. I was able to attend several of the panels, and what follows is an overview of prominent themes that threaded through the assorted talks on recent achievements, challenges, and best practices in public interest litigation. The range of speakers offered a unique lens through which to examine the state of Canadian public interest litigation and the proper role of those seeking to advance the public interest. The conference’s first panel discussed recent cases in British Columbia and Ontario that brought challenges to the constitutionality of correctional uses of solitary confinement in Canada. Sitting on the panel, Lisa Kerr, Assistant Professor at Queen’s Law, argued for the importance of hearing from the, often marginalized, groups that are actually affected by the litigation. She noted that in the case litigated in BC by the BC Civil Liberties Association and the John Howard Society, the experiences of those subjected to prolonged segregation were highlighted. In contrast, she remarked that such voices were notably absent in the Ontario case. 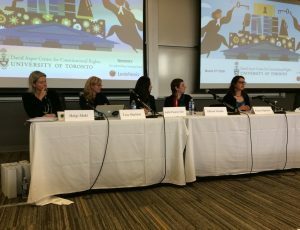 Kerr and the other panelists, Alison Latimer and Kelly Hannah-Moffat, discussed the importance of including indigenous, women’s, and mental health perspectives in the discourse and litigation. The cases provide an opportunity to rectify the shocking use of administrative segregation and the adverse impacts it has on already marginalized groups. Sensitivity to the experiences of marginalized and vulnerable groups and individuals was an active topic throughout the conference. Reinforcing this point, Helgi Maki and Tess Sheldon spoke to the significance of practicing trauma-informed law. They argued that lawyers have a professional responsibility to meet their clients’ needs and interests, and where trauma might cause impairments in memory, communication, and trust, lawyers ought to build a professional relationship that is attentive to these considerations. Understanding the effects and experiences of trauma, they explained, can facilitate more fruitful and sensitive lawyering. Many of the speakers referenced the fact that public interest litigation does not occur in a vacuum, since the wrongs we seek to redress affect real individuals. Reflecting upon the case of PS v Ontario, where PS, a deaf man, had been involuntarily detained for 19 years under the Mental Health Act, Karen Spector discussed the considerations public interest work must always bear in mind when advocating for the interests of persons with mental health disabilities. She reviewed her experience acting for the Mental Health Legal Committee in their intervention in the PS case before the Consent and Capacity Board. She noted that it is the role of interveners to ensure that adjudicators are aware of the consequences of their decisions on the wider communities. Whether they are party to the litigation or have experienced the disproportionate impacts of the law, public interest work nearly always involves vulnerable groups. As several speakers argued, it is incumbent upon the legal profession to always be mindful of how intersecting factors can shape the experiences of the clients and groups we serve. The value of engaging with affected communities is not confined only to test cases or intervention, but extends outside of the courtroom. Josh Paterson, Executive Director of the BCCLA, noted his organization’s ongoing efforts to work with affected individuals. In the case of Carter v Canada, the BCCLA employed this strategy to hear from affected individuals, and then convey their stories to spread awareness and understanding, whilst also garnering public support. Not only does engaging affected communities involve hearing from specific individuals, but it can also demand that public interest work involve media work to foster support from the broader public. Anne Levesque shared the meaningfulness of public support in the First Nations Child and Family Caring Society v Canada case, which concerned the government’s gross underfunding of services for First Nations children. The case spurred the “I am a Witness” campaign, which first started as a public education initiative, but evolved into its own social movement. The campaign cultivated public support, lead the hearings to be televised, and allowed First Nations children to attend the hearings, enabling them to engage in the litigation that would directly affect them. Levesque stressed the significance of this public engagement in the success of the litigation. Engaging a public audience can also provide financial support for public interest organizations to forcefully pursue litigation efforts. Given the constraints of public interest organizations’ limited budgets, utilizing crowd-funding is a strategy used by the BCCLA. Paterson noted that leveraging social media to encourage donations helps the BCCLA to employ staff litigators, pay for expert evidence, and the numerous other expenses that come with advocacy. Discussions of the solitary confinement cases that opened the conference underscored the reality that substantive change will likely require legislative and policy reform, including the establishment of independent legal oversight for decisions relating to administrative segregation. In addition to litigation work, public interest advocacy often also requires public education, fundraising, and law reform efforts. In the solitary confinement cases, public interest organizations acted as plaintiff/applicant. Nevertheless, the default of Canadian public interest litigation has generally been to intervene in compelling cases, however there are many barriers facing organizations who attempt to do so. As counsel for the Canadian Council of Christian Charities (CCCC), Barry Bussey had first-hand experience of the controversy that arose in the summer of 2017 in the TWU v LSUC case, when the Supreme Court initially denied intervener status to 17 applicant, including the CCCC and all LGBTQ groups. While all of the parties were eventually granted status, the incident prompted many conversations about the role that interveners ought to be playing. Bussey noted that interveners are generally intended to assist the court and allow the public some access to justice, but an emphasis on “balance” and efficiency places demands on interveners that may undermine their effectiveness. For instance, the Supreme Court restricts each intervener to a 10-page factum and five minutes of oral argument. Interveners are also prevented from introducing new arguments or facts on appeal, and yet are required to present a unique perspective that is different from the parties and the other interveners. Despite challenges, interveners are common in Charter litigation, especially at the appellate level. Kathryn Chan and Howard Kislowicz’s research revealed the significant extent to which various interveners are involved in cases of religious freedom. The prevalence and degree of intervener involvement raises questions of how interveners can best engage in litigation. Tensions arise between our desire to hear from a diverse and robust set of interested parties, and a need to prevent redundancies with overlapping constituencies and interests of intervening parties. Dan Sheppard examined the many nuances of intervening in cases raising constitutional issues, concluding that the Supreme Court’s attitude towards interveners has been broad but not deep. While interveners have historically been embraced, Sheppard suggests that the Supreme Court welcomes interveners only to lend their decisions the appearance of legitimacy, rather than engaging with interveners in a more substantive way. Since intervention remains a more economical way for public interest groups to be involved in litigation, it falls to us to consider whether our current approach can be improved. Despite various hurdles, interveners currently remain an essential part of advancing social change in the justice system. As Joëlle Pastora Sala & Allison Fenske noted, a tenet of “public interest law is that it is unreasonable for ‘individual members of already vulnerable social groups [to] bear the burden of privately litigating broad-based systemic challenges.’” As lawyers at the Public Interest Law Centre of Legal Aid Manitoba (PILC), Sala and Fenske discussed their success in Stadler v St Boniface. PILC intervened in the case, in which the Manitoba Court of Appeal ruled that the province’s social benefits tribunal has the jurisdiction to hear Charter issues. While interventions are a common means of effecting change by informing the judiciary of the nature and scope of the interests at stake, speakers discussed the need to streamline the involvement of interveners without losing the meaningfulness of their contributions. Although public interest litigation can be a demanding endeavour and there are numerous battles still to be won, overall the conference struck an optimistic tone. Positive achievements, such as in the solitary confinement cases, demonstrate the value of public interest litigation. But, rather than idling in our successes, most speakers deliberated on how public interest litigation might be developed to better achieve its goals. Basil Alexander presented his work, which surveyed the practical realities of cause lawyering, finding that they employ a multi-faceted approach to effecting change, but noted that various advocacy strategies have their own advantages and drawbacks. Alexander’s presentation tied in with the conference’s final panel on funding. Gabriel Latner spoke about how Canadian public interest groups may be able to learn from American approaches to advocacy. Many conference participants felt that public interest litigation in Canada functions differently in part due to Canada’s small size as compared to the United States; however, funding and coordination amongst stakeholders remains a concern. Wayne van der Meide presented on Legal Aid Ontario’s Test Case Program, which can help fund public interest litigation in Ontario although other funding strategies must be engaged. In the pursuit of dynamic and potent public interest litigation, research on what works in public interest litigation can complement experiments in alternative advocacy models. Reflections on Canadian public interest litigation suggest that the never-ending work admits of many challenges, but all are committed to informed and effective advocacy. Amanda Nash is a 3L JD Candidate at the Faculty of Law of the University of Toronto. This entry was posted in Commentary, Events. Bookmark the permalink.